The Adult Fans of Nerf site gave me the heads up on this new Nerf product coming out. The author of the book contacted AFON and said that the book will releasing new information on future blasters once it comes out. Here’s the description via Amazon.com. The first-ever official NERF book, a stunning visual guide to the iconic blasters–from the very first ones ever made to a sneak peek at the blasters of the future! 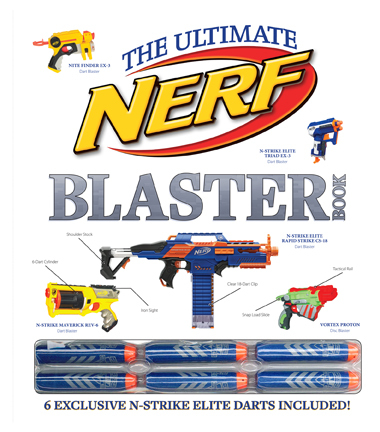 Packed with photos and facts, this comprehensive tour of NERF blasters features a high-energy design, kid-friendly format, and an exclusive set of 6 specially designed (and highly collectible) foam darts incorporated into the cover. In the tradition of the LEGO Star Wars Visual Dictionary (more than a million copies sold), this is the definitive guide to the iconic NERF blaster, and a book that all NERF fans will want to own. 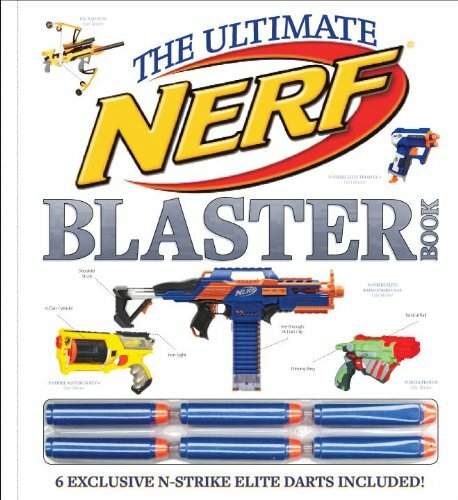 A hardcover, full-color collector’s volume, NERF: The Ultimate Blaster Book presents each blaster in a fully illustrated, detailed spread that provides a complete array of technical specifications (range, capacity, propulsion type, etc. ), the story behind the blaster, and callouts explaining its special features. Sidebars offer factoids, activities, and more. And with 6 exlusive, collectible darts included in the front cover of every book, this lavishly illustrated book is the ultimate NERF must-have! I wonder if those darts are any different from the normal Elite Darts? They certainly look a little bit different. Amazon has the book coming out October 29, 2013, and you can pre-order it on Amazon as well. And on a side note, the Rapidstrike right there on the front isn’t helping my need for it at all.